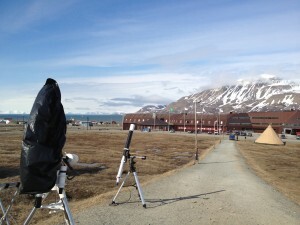 It’s around seven hours to first contact and the Svalbard teams are uncovering their telescopes to make final checks and prepare for a night of observing. The sky is clear in places, but clouds currently hanging over the mountains could pose a problem later. Meanwhile the local events hosted by the university and Svalbard museum are being prepared – a teepee has sprung up not far from the telescopes! The program of events includes a trio of public lectures. Thomas Widemann from Paris Observatory will review the history of Venus transits and their relevance to exoplanets, ESA’s Dimitry Titov will present highlights from Venus Express, and David Grinspoon from the Denver Museum of Natural History will discuss ‘life on Venus and relevance to Earth’s climate’.